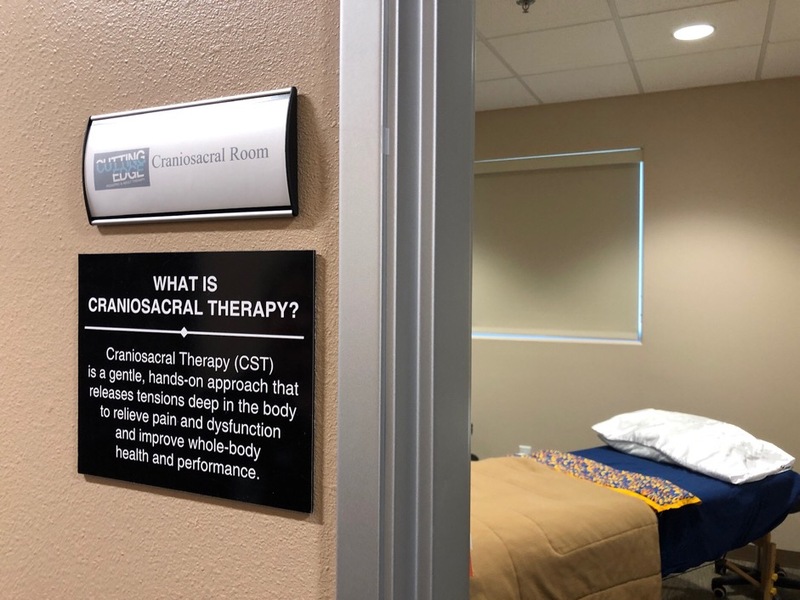 If you’ve been in our offices you may have seen our craniosacral therapy room. This room has a sign by the door that explains what craniosacral therapy is in very simple layman’s terms. This is a great modality that we use in all our locations. This is how we work on the eighth sensory system, which we call the interoception system. This is an awareness of your body and how your body’s feeling. If we’re trying to teach zones of regulation, or self-awareness, we are able to do that with craniosacral therapy. My child wouldn’t do this. Many parents and caregivers think, “My child will never lie on a cranio bed and participate in treatment!” But they do, and they really enjoy it! We also use craniosacral therapy with our clients who are struggling with anxiety which is preventing them from being functional. We might use craniosacral therapy for half a session, or sometimes just for the first or last 10 minutes of a session. An extra benefit is that it helps with transitions! What’s in the craniosacral room? Inside the craniosacral therapy room, we have a special craniosacral bed that is a massage table. On the bed is a special pillow that is a bone conduction pillow. We have a nice, comfortable satin pillowcase on top of it, and we hook an iPod up to it. This iPod has music on it that is modified similar to the music we use in our listening programs. When the music plays the bone-conduction unit inside the pillow vibrates. This lets us provide not only the craniosacral therapy but also lets us provide some deep proprioceptive input and calming. Some of our beds have weighted blankets, as well. We also have some lava lamps and fun lights in here. We can dim the lights, and the rooms have blackout shades so we can even make it dark. In all of our locations, we also use this nice, quiet, private room to do kinesiotaping. Our OTs, PTs and speech therapists all do kinesiotaping. Our PTs might be taping lets, our OTs might be taping backs, shoulders or arms, and our speech therapists tape faces. If craniosacral therapy is a modality you’d like more information on, let us know! We have some brochures that give you more information. We are also more than happy to give you more information on kinesiotaping.